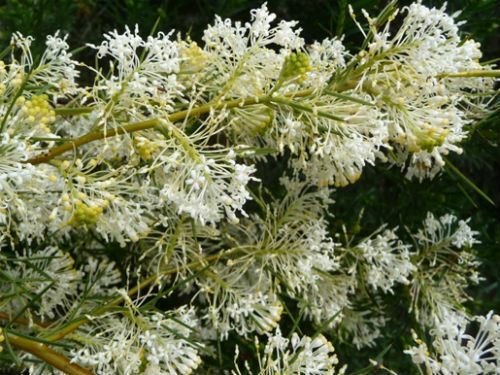 Grevillea anethifolia is known as the Spiny Cream Spider Flower and is a medium, spreading shrub. Our specimens reach a height of two metres with a similar spread. The leaves are light green, five centimetres long, divided, narrow-linear with prickly points. Although prickly, the foliage has a soft appearance when viewed from a distance. The flowers are creamy-white, conspicuous, profuse and sweetly perfumed. The lengthy flowering period extends from August to December. The attractive foliage provides a contrast with the abundant blooms. Grevillea anethifolia has a rather scattered distribution. There are populations in western New South Wales, southern South Australia and southern Western Australia. Plants respond positively to pruning. We are very fond of Grevillea anethifolia. We have many specimens scattered throughout our cold climate garden. We have found this species to be hardy, free-flowering, fast growing and propagates rapidly from cuttings.